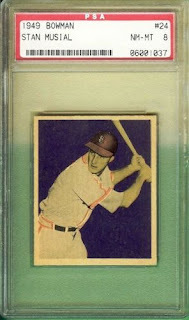 WhereTheyAint.com: 1949 BOWMAN STAN MUSIAL PSA 8 CARDINALS FOR SALE!!! 1949 BOWMAN STAN MUSIAL PSA 8 CARDINALS FOR SALE!!! Currently for sale is a beautiful 1949 Bowman Stan Musial PSA 8!!! This card is beautiful!!! 1954 BOWMAN #66 TED WILLIAMS PSA 8 FOR SALE! !